Jamie C. Fagan is the managing director of J.P. Morgan Securities in Boston. A graduate of the University of Vermont, Jamie has more than 29 years of experience in the Wealth Management industry and was listed to Barron’s Top 1,200 Financial Advisors for 2014 and the Top 1,000 Financial Advisors in 2013. Prior to J.P. Morgan Securities, Jamie was at the company’s predecessor, Bear Stearns, in 2006, and was senior vice president at Lehman Brothers from 2001-2006. He began his career in finance at Smith Barney in 1984, and his career in sales even earlier, working as a toothpaste salesman for his first job. 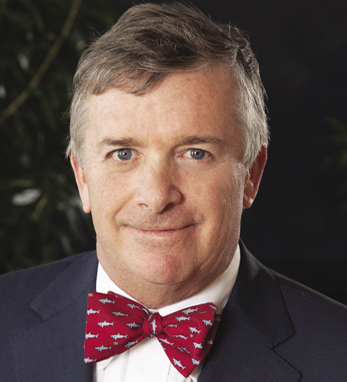 He is highly involved in community affairs, and serves on the board of the New England Aquarium, where he is also the chairman of the Endowment Fund, as well as the Turtle Ridge Foundation which supports disabled athletes. Jamie currently lives in Boston with his wife, Katie, and labradoodle, Lioness. He and Katie have three grown daughters and enjoy gathering the family at their home in Baddeck, Nova Scotia. A third-generation Irish American with roots in the North, Jamie says his family is always impressed with the “extraordinary wit and enthusiasm for life that Irish Americans possess,” which he says “spans generations.” He is a five-time Massachusetts State Men’s Open Doubles Squash Champion.